From Reno it was on to Las Vegas, with a detour. On the way we saw the signs for Death Valley and decided we had enough gas to give try and make our way through. 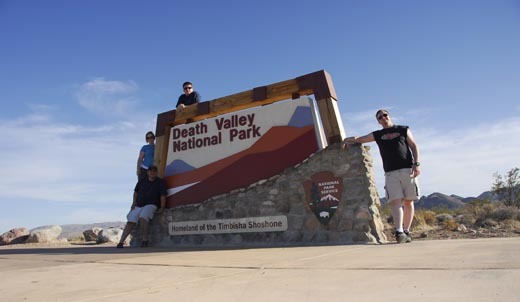 Death Valley is hot on a whole different level than anywhere I’ve been in the United States before. When we got to the bottom of the valley and hopped out to see what it was like, we were surprised. I mean, you know it’s going to be hot, but wow, my eyelids actually hurt. Back on the road to Vegas we ended up arriving at about 10pm. Two hours later than anticipated. We met up with the rest of the Vegas crew and began Vegas-ing. This was a much different trip to Vegas for me. For one, I was looking down the barrel of a fixed budget for the next year or so while standing in one of the most potentially expensive places on earth. But we made it work. I didn’t gamble (although there was this great craps game I really should have hopped in on) and we bought liquor in volume and premixed our drinks on the strong side in Gatorade bottles. That achieved the goal very nicely. Beyond that it was walking around and looking at stuff, eating at cheap buffets, and tossing the occasional $20 at a “Wheel of Fortune” slot machine. Summer was able to fly in on Saturday night which was an incredible treat! Having her in Vegas with me made it all that much better. We’d had a hard goodbye-for-now a not even a week before when she had left for work a few days prior to my departure from Oregon. We’ve put rough plans into play about where and when we will be able to meet up on the trip but nothing is concrete. It was nice to see our first attempt work out so well. The crew started departing on the 24th and dwindled to just me in Vegas on the 25th. About 8pm I started heading out of town. It was too dark to drive to the glass bridge overlooking the Grand Canyon so I decided to make a run for Monument Valley in Utah. 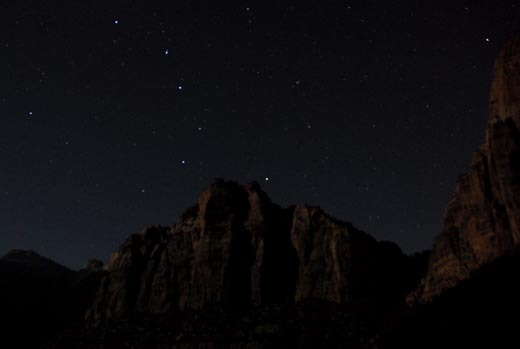 I ended up driving through Zion National Park at about 11pm. I would love to drive through that area again during the day. Based on the silhouettes alone it was a beautiful place. I made it as far as Page, Arizona where I slept in a Denny’s parking lot for a few hours. I’m in a Starbucks parking lot right now about to make my way towards Monument Valley, Utah. More to come, but here is the first post of the adventure. 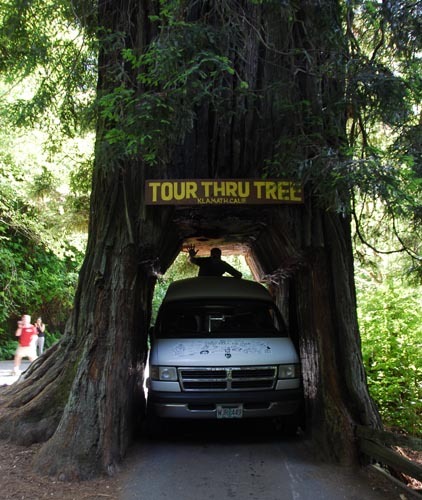 We headed south with half a tank of gas and a destination of The Redwood National Forest as our first official stop. The van was plastered with the magnetics for the site and the (mostly) well wishes from my going away party. (In order of appearance) Eric, Myself, Chanti, and Erik were on the road. We arrived in the Redwood Forest at about 2pm and marveled at the size of these ancient giants. Oh yeah, then we tried to drive the van through one. 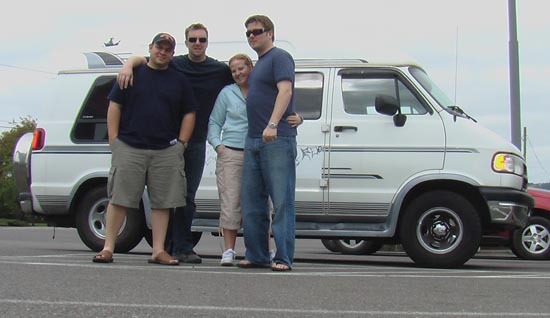 If you notice the dark shape on top of the van in the picture, that’s me. I was able to see just how close we were to grinding our way through the tree. Everything was going well until we were about to exit the tree and it looked like we would loose our mirrors. Since I still need them until Georgia, I called it off. 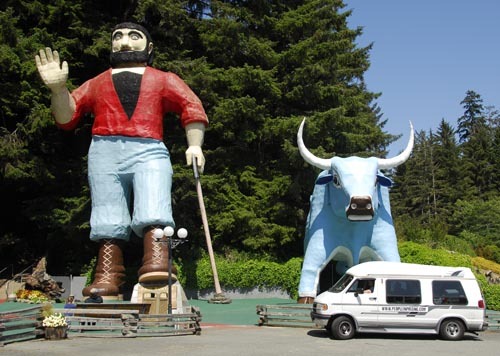 We also stopped by the Tree’s of Mystery to visit the largest Paul Bunyon and Babe the Blue Ox statues in existence. The Paul statue is wired to a man-behind-a-curtain that speaks to the many children climbing over the statue. Seems the jaw was supposed to move in unison with the voice but had broken down. The hand still waved at a random interval. Then off to Reno which was a little further away than I’d thought it was. By the end of the day we’d put in about 1100 miles. Here are some unfinished notes from a trip to China and Japan back in 2003. 1. 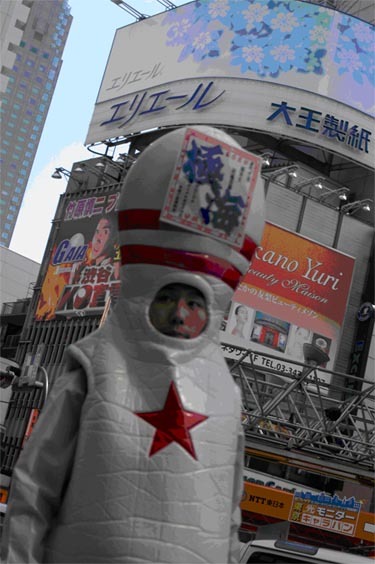 The most useful thing you can know before going to Japan is… wait for it… Japanese. I’ve been to several other countries where English was not the predominant language and muddled my way through it but China and Japan are a totally different situation. With a Latin based language you can at least read and, however poorly, pronounce the words you are looking at and start to infer some meanings. Not so with character based languages. You can see the characters but you have no idea what kinds of sounds to put with them. The thing that this most hampers is the ability to feed oneself. There are lots of plastic food displays but there is no Romanized version of the Kanji so that you know what to ask for, the only thing you know is how much it costs (and that it looks tasty). So far my answer for this is find places where you can just grab what you want and pay for it. Places with the sushi belt, sandwich stands, etc… I’ll keep trying new things while I’m here but making sure I stay fed is key. 2. I should have learned this in Germany but I guess I didn’t. There is no need to tell someone from the country you are visiting that you do not speak their language. It’s amazing how clean it is for as many people as there are. It’s actually very difficult to find a garbage can to get rid of something in. Even with that there is almost no trash on the ground. The sheer number of people all the time is almost overwhelming. The lack of beggars and crazies is also pretty amazing. Given the population density the only place I can compare Tokyo to in the US is New York. And the per capita crazy bum for New York has to be about 50 or more there to 1 here. Why is that? Consumerism is in full swing, and you have to have some serious money to play. Our exchange rate doesn’t help anything but even without that most everything is more expensive than it is in the States. I expected to find a gadget playground at very cheep prices. For many of the toys I brought with me on this trip this is their first time home in years. However, there are many varieties of the same technology, all very expensive. Same goes for clothes, if not more so. I was hoping to pick up a jacket or suit coat, since the one I brought with me has likely made for the best dressed taxi driver in Shenzhen. Yeah, I forget things, a lot. So what else, the sushi has much bigger (better) cuts of fish and less variety than I’m used to. The sounds and smells of Tokyo make for as much of the experience as the sights. I’ve done some audio recording to go with the pictures. It should make for an interesting twist on the traditional slideshow. Right now I’m waiting for the washer/dryer to finish my socks. I figured out how to make it work but didn’t anticipate how long it would take to dry, else I might not have washed all my socks… So since I’m being held hostage by Japanese technology, I’ll watch another episode of the West Wing Season II (thank you Chinese pirates) and have another coffee-in-a-can. Still 48 hours to go, anything can happen. I have lots of maps and lots of guidebooks. They are all very good at what they were designed for but also very specific. Trying to tie multiple regions together without flights on a grand scale, in a way that makes sense, is not easy. I’ve been looking for a way to map out potential routes without much luck. 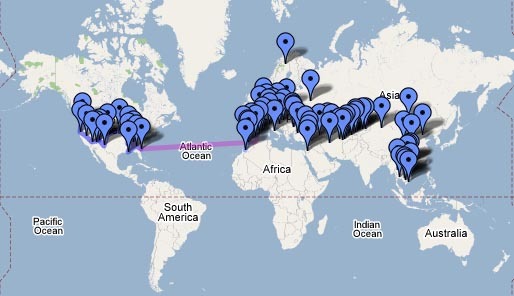 Many mapping sites become useless when you start looking at locations overseas and I’ve found that many of the “Web 2.0” travel sites have mapping and route planning, but none of them work like I would like them to, yet. Google Earth has been invaluable in trying to understand the relative placement of cities, countries, etc… and until recently Google Maps (just the site, not the many one-off hacks) would only let you do single destination driving directions. That has changed with a recent update and now Google Maps will let you have as many destinations as you want in the US (however, add in something like “Grand Canyon” and it will break down). I’ve been playing with the “My Maps” function of Google Maps a lot in the past couple days and have added in most of the places I hope to visit and a rough route has taken shape. Right now anything past the USA is uncertain, so there aren’t any route lines to any of the locations. The list of locations will probably grow and I hope to adjust the map with real travel information as I go, so take a look and let me know if there are some places I should plan to visit that I don’t have flagged yet. While cleaning files off my company laptop I came across an old writing assignment and I thought it fit the theme here. My father was drafted into the military during the time of Vietnam. Fortunately for him, and most likely for me, he was not drafted to Vietnam. He was stationed in Baumholder, Germany to guard a line in the sand between Communism and Democracy. Other than routine training and miscellaneous military duties there wasn’t much to do. Growing up he told me stories about Germany and some of the things he did there. One of things that he talked about most often was the quality of the German workmanship. He told me of a suit maker that made beautiful custom suits by hand. The suit maker would take your measurements and send you on your way; you were given no choice of fabric or style. The suit maker would choose what was best for you and three weeks later your suit was delivered. He told me of the woman that did their laundry. That she used so much starch they actually had to use two hands to pry the clothes apart. And he told me about the camel hair overcoat he had purchased there. This was a beautiful coat that he gave to me when I moved out. Unfortunately, I have since grown out of my father’s coat but I still keep it because it meant something to him. In October of 2003 I was told that I was being sent to a training class on yet another software product my company would soon be selling. I am always being flown to one place or another to sit in a classroom for a day and a half to become “certified.” More often than not I’m left in the end with little more knowledge than I had before and a pocketful of hotel soaps and shampoo. I went through the exercise of checking the class schedule for this trip and noticed that there was one class in Minneapolis and one class in Munich. I immediately thought that given our domestic airline situation this would cost nearly the same. The price difference ended up being about one hundred dollars. I asked my company if they cared where I went to training if I paid the difference in flight costs and they said no. So I was off to Germany. I arrived in Munich compressed into a smaller form thanks to the gentleman that sat in front of me. I believe he was convinced that if he leaned back hard enough I might disappear and his chair would turn into a bed. I arrived in Germany speaking no German and having not done enough research. Once I found my way onto the U-bahn, the German subway, I headed in the direction of my stop. After getting off the train I began to think about how useful it would have been to remember the raincoat I bought and left in my car. It was about fifty degrees Fahrenheit and raining, not a Portland rain but a Midwest rain. The only protection I have from the elements is an undershirt, polo shirt, and a pair of jeans none of which were keeping me warm or dry. I was burdened by one large heavy backpack on my chest and another larger heavier backpack on my back. At this point was drenched and rather pathetically wandering around the streets in search of someone that spoke English. I eventually found a security guard that understood just enough to guide me to my destination. Soggy and happy I arrived at my hotel. After a solid night’s sleep and watching The Simpson’s overdubbed in German I was ready to go get my own overcoat. Again I boarded the U-bahn and headed toward the city. The German subway is truly something to behold. The underground stations go on forever and are stories deep; they have city blocks of groceries and retail outlets. I surfaced to find myself at an eight story department store. I found my way to the men’s department and located the coats. Granted this was not the way my father bought his coat, but this would be the way I bought mine. I tried on several varieties with a salesperson standing with me and telling me how good the coats looked, speaking only in German. However, I’m not positive he was complementing me, for all I know he could have been telling me I looked fat. The coat I settled on is a deep charcoal single breasted four button overcoat. The buttons disappear behind an extra flap of fabric so as to create a seamless appearance. It has a dull gold satin lining with a zippered inside pocket. The outside pockets are deep and wide enough to accommodate winter gloves. Just behind the right exterior pocket there is another zippered pocket, a third outside pocket that inconspicuously gives a bit of extra cargo room with a little additional security. The coat hangs just beneath my knees and the arms are long enough that the ends of the sleeves fit perfectly into my hands as I cup them by my sides. This is a store bought German coat, not quite as nice as my father’s German coat. It is, however, my German coat. Long after this coat has begun to fray or I have again grown out of it, I will still have the story of how I came to own it and that to me is more important than the object itself.